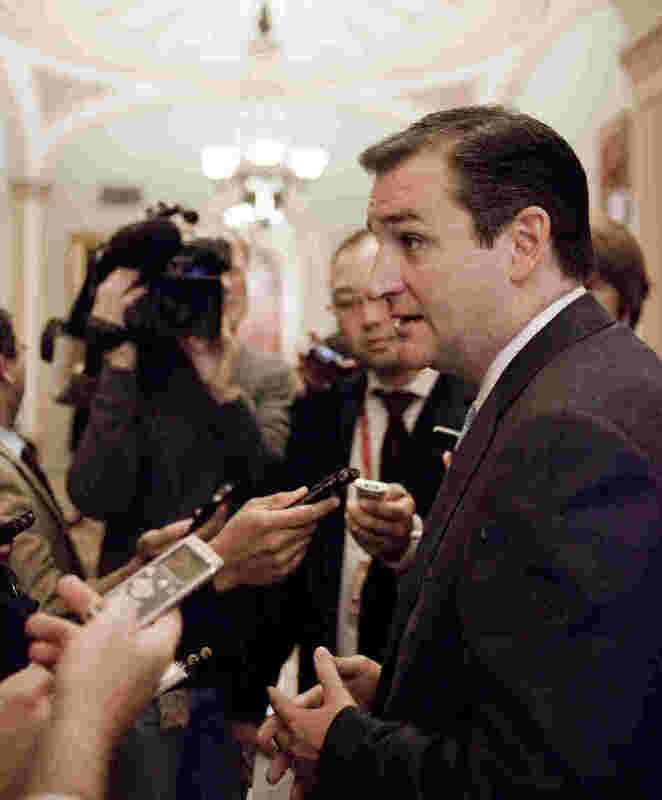 Texas Republican Ted Cruz, then senator-elect, speaks to reporters before a freshman senators luncheon on Nov. 13. The keynote speaker at Saturday night's closing session of the Conservative Political Action Conference is a 42-year-old Texan who's been a U.S. senator since January. In that short time, Tea Party Republican Ted Cruz has already made a mark — and in doing so, he's simply ignored a tradition of new senators being seen, not heard. Cruz's sharp elbows have some colleagues wincing and others hoping he'll run for president. If the junior senator from Texas was holding back at all in his first weeks on Capitol Hill — and it's not clear how much he really was — this week he let Ted Cruz be the full-throated conservative Ted Cruz his Tea Party backers sent to Washington. On Wednesday, Cruz called his first news conference to warn that President Obama's health care law could wreak "enormous harm, enormous damage to the economy." "That is why the very first bill I introduced in the U.S. Senate was a bill to repeal every word of Obamacare," he said. "But at a minimum, Obamacare should not be implemented at a time when the economy is grasping for breath." Cruz then got all his fellow Republicans to vote for a measure he sponsored barring any funds for implementing Obamacare until the economy has fully recovered. Not one Democrat voted for it. Undaunted, Cruz requested time for his "first official speech on the floor of the Senate." Cruz noted that his debut on the Senate floor actually came last week, when he read a letter from the leader of Texans holed up at the Alamo, as well as the opening monologue from the movie Patton. It was all part of a filibuster against now-CIA Director John Brennan's nomination, led by fellow Tea Party Republican Rand Paul. "That is a debt I will always owe Sen. Paul," he said, "because, as they say in the beer commercial, 'It don't get no better than that.' "
When asked later why he happened to make his maiden Senate speech this week, Cruz said: "I very consciously waited until now to respect the traditions of the Senate." During his upstart Senate campaign last year, Cruz referred to other Republicans as "spineless jellyfish" and "graybeards." University of Texas Senate expert Sean Theriault says Cruz's Republican primary rival, Texas Lt. Gov. David Dewhurst, had been the pick of the GOP establishment for that Senate seat. "But if you wanted someone to go in there and shake things up, then Ted Cruz was your option," he says. "And, in fact, he's gone there and he's shaken things up." That became clear late last month when Cruz, who was a champion debater at Princeton before getting a law degree from Harvard, suggested Obama's nominee for defense secretary, Chuck Hagel — who has since been confirmed — might be on the take from disreputable regimes. “ I am focused 100 percent on my job right here in the U.S. Senate. I've been here all of nine weeks, and we've got a lot of challenges right now. "It is at a minimum relevant to know if that $200,000 that he deposited in his bank account came directly from Saudi Arabia, came directly from North Korea," Cruz said. That allegation brought Cruz a scolding from fellow Republican Sen. John McCain of Arizona. "I just want to make it clear: Sen. Hagel is an honorable man. He has served his country, and no one on this committee at any time should impugn his character or his integrity," McCain said. Cruz drew another public rebuke Thursday from California Sen. Dianne Feinstein, a Democrat. The former Texas solicitor general had been explaining to her the fine points of the Bill of Rights at a meeting of the Senate Judiciary Committee. Feinstein caustically thanked Cruz: "I'm not a sixth-grader. Senator, I've been on this committee for 20 years." Despite those clashes, or perhaps because of them, Cruz's stock has been soaring among conservatives. Cruz, who was born Rafael Edward Cruz in Canada to a Cuban father and American mother, is among the 23 names on CPAC's presidential straw poll. Cruz has said before he would be eligible to be president, but ducks when asked whether he wants to be president. "I am focused 100 percent on my job right here in the U.S. Senate," he says. "I've been here all of nine weeks, and we've got a lot of challenges right now, and that's where my focus is." That's not quite a no from a man who may be the Senate's bad boy, but is also one of its rising stars.